﻿ AnyCommunicator - Master your time and communicate effectively! 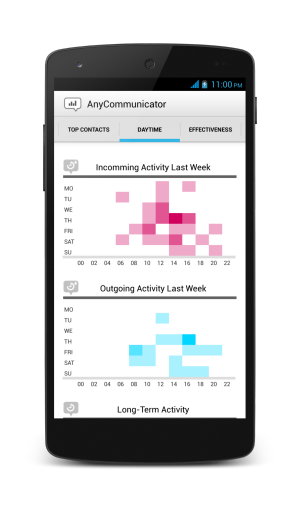 AnyCommunicator is an Android app that will give you an unique insight into your communication. 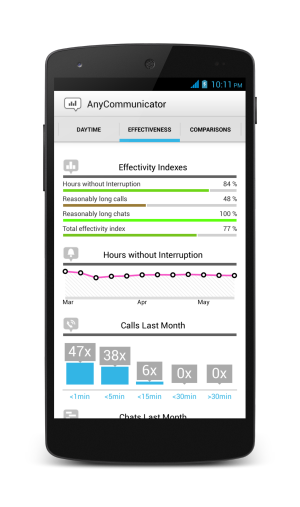 Simply install the AnyCommunicator app from the Google Play and launch it. 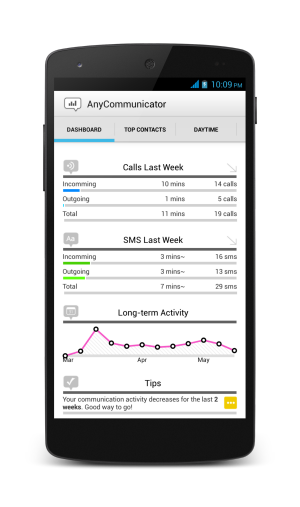 The app immediately analyzes your call and SMS log into a lots of interesting charts to explore! Nothing. The app is free. It just shows you some ads on the bottom of your screen, that help us running the service. What will I find out? Will anyone see my calls and messages? No way! We take security seriously. 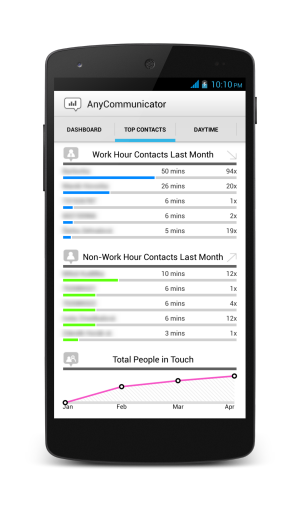 The app only takes your communication metadata (date, time, numbers, contact names, sms and call lengths) and aggregates them to useful charts and lists. These results are processed on your device and shown to you only. They get never stored or sent anywhere without your permission! Really. But if you want, you may take your annonymized aggregated stats (like average call length, average number of calls/messages per day, etc.) and compare them to the annonymized statistics of other users of the app that have agreed to do so.